When advocating for afterschool, it's important to know what to say and how to say it. This section includes talking points and facts, as well as some basic outreach strategies that will help you get your message out to policy-makers and the public. Here you can find plenty of details on how to start your own issue campaign to keep afterschool in the spotlight. These three strategies are straightforward, easy ways to spread the word about the effectiveness and impact of afterschool programs. When doing outreach, look at three key audiences: the media, the candidates, and the field of afterschool supporters. We want the public to know why afterschool matters, and candidates to know that supporting afterschool is important to voters. The parents of 19.4 million children would send their child to an afterschool program—if one were available. Nearly 9 out of 10 voters are concerned that children are unsupervised after school with too much unstructured time. We can’t afford not to invest in afterschool programs. Afterschool programs save at least three tax dollars for every one spent by reducing the need for remedial education and grade repetition as well as keeping kids safe and out of trouble. 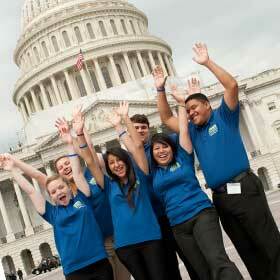 Voters want government at every level to invest in afterschool. 9 in 10 Americans think afterschool programs are important. 8 in 10 parents (83 percent) support public funding for afterschool programs and want to see all levels of government to commit funding. Parents of 19.4 million children (41 percent) say they would enroll their children in an afterschool program if one were available to them. Voters say they are willing to use taxpayer money—and even pay more in taxes—to support afterschool programs. For more information on voter attitudes, look at the polling data section of the Afterschool Alliance website. Dozens of formal studies clearly demonstrate the effectiveness and impact of afterschool programs. Example No. 1: Elementary school students attending LA’s BEST afterschool program improved their regular school day attendance and reported higher aspirations regarding finishing school and going to college. Participants were also 20 percent less likely to drop out of school compared to matched nonparticipants. Example No. 2: High school students participating in Chicago's After School Matters program have higher class attendance, lower course failures and higher graduation rates than similar students who do not participate in the program. For more information go to the Facts & Research section of our website. Unfortunately, adequate childcare is not always available in every community. Nationwide, nearly 5 million children in grades K-8 regularly care for themselves. Today, less than one-fourth of American families fit the “traditional” image of one parent at home caring for children full time, while the other parent provides financial support. In fact, 77 percent of mothers with school-age children are employed. The gap between work and school schedules can amount to as much as 25 hours per week. The bottom line is this: afterschool programs keep kids safe, inspire them to learn and help America’s working families. 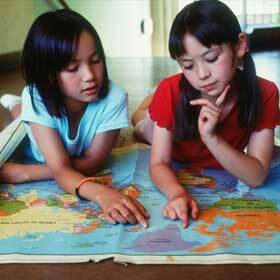 The realities of today’s working world make afterschool programs an absolute necessity. 21st Century Community Learning Centers (21st CCLC)—a $1.3 billion funding stream that supports afterschool programs in thousands of communities across America. For information on how to reach the audiences that matter most to your campaign, check out our Key audiences and Easy outreach strategies pages. Making your voices heard at key moments is critical! Take a look at how a bill becomes a law to see where the key decision points fall in the federal policy making process. For background on how state budgets are created, go to our State Policy Center. For more ideas on how to take action, and key advocacy dates for this year, visit our Take Action Center. 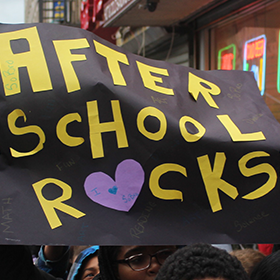 The Candidate’s Guide to Afterschool provides a primer on afterschool issues for candidates. Gather signatures on the downloadable Afterschool for All Community Petition.